With 5G on its way, take a look at some of the advances being made and challenges that still lie ahead. 2G gave us voice. 3G gave us data. 4G gave us video. Now 5G is coming, which gives us high-quality video, and Mbps to Gbps speeds. 5G anticipates the tremendous growth of the Internet of Things (IoT). I attended the recent DC5G Summit, "Revolutionizing Mobility," held in Washington D.C. on October 11. This one-day summit provided an educational environment for participants to present the varying views of what is going to happen with 5G, its application, and its use of software-defined networks (SDN) and network function virtualization (NFV). Speakers also focused on challenges for security, privacy, bandwidth allocations, and regulatory barriers. 5G will be an end-to-end system that enables a fully mobile and connected society. 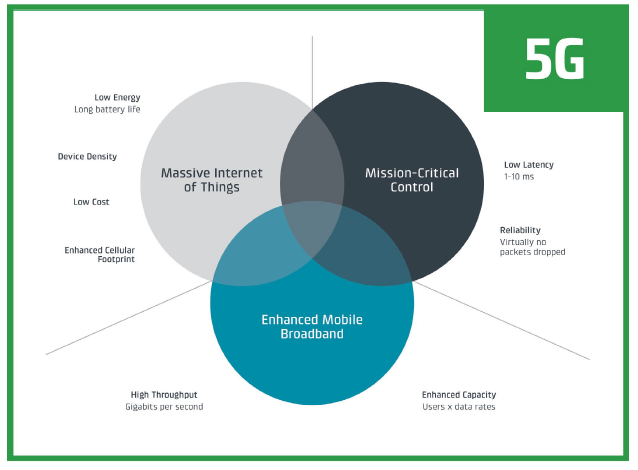 Anticipated use cases for 5G include high capacity/high performance outdoor and indoor broadband access in urban areas, expanded user mobility, IoT device connection, ultra-reliable lifeline communication, and broadcast-like services. The graphics in this blog are from Cradlepoint's report, "State of 5G 2017 & Beyond." 5G will have a native SDN/NFV architecture supporting a range of devices, (mobile/fixed) infrastructure, network functions, and other beneficial capabilities. It will provide enhanced antenna technologies for massive multiple input, multiple output (MIMO) operation at frequencies below 6Ghz. New antenna designs with smaller and practical form factors are needed since a large number of antenna elements at higher frequencies will be deployed. 5G deployment will likely be via small cells, especially for the mobile environment (see the Small Cell Forum for the state of small cells implementation). Small cells are low-powered cellular radio access points that operate in licensed and unlicensed spectrum that have a range of 10 meters to a few kilometers. They are "small" compared to mobile cellular systems. Small cell technologies make best use of available spectrum by re-allocating the same frequencies many times within a geographical area. Since few new macrocell sites are under construction, a large numbers of small cells can fill the gaps called densification. This is an important method of increasing cellular network capacity, quality, and resilience. The 3rd Generation Partnership Project (3GPP) collaborates with telecommunications standards development organizations (ARIB, ATIS, CCSA, ETSI, TSDSI, TTA, TTC) and provides their members with an environment to define 3GPP technologies. Hopefully these will be completed sometime later in 2018. Standards will allow coordinated handoffs between network operators, including cell phones, tablets, and vehicles. The standards will provide infrastructure providers and device makers guidance when designing their solutions. The solutions need to be able work globally, not just regionally. A good reference document is the IEEE's "Standards for 5G and Beyond: Their Use Cases and Applications." The standards are not done, but most vendors are already working on products to deliver 5G capabilities. Some are not waiting for the standards to be completed so they can get a jump on the market but this may introduce some proprietary designs that are not standardized. Carriers like Verizon and AT&T are trying to accelerate the innovation. Some providers are using 5G technologies to pass large amounts of data from one fixed point to another as an alternative to fiber connections. True mobile wireless 5G however may be years off as shown in the chart below. Initial tests and deployments of fixed wireless 5G exist today. The fixed wireless is designed to replace fiber, cable, and DSL connections especially for last-mile connectivity. The standards should be ready by 2018 or 2019. It is not likely that 5G will replace Wi-Fi but will augment it for indoor networks, and may become a competitor. The designation of 5G was created by 3GPP in February of 2017. Do not expect any 5G ready cell phones in the next year or two. Initial penetration of the market will probably be only fixed wireless transmission. The high-frequency spectrum that is allocated for 5G is not proficient at penetrating walls, people, leaves, and other materials. Do not expect major 5G deployment, especially for the mobile community to be available until about 2020. One of the points made at the summit was that whatever the antenna systems and its electronics look like, they will have to be small -- probably not much bigger than a large coffee can. This means a lot of development has to occur before 5G can be deployed. It also means that the small units can more easily be installed on telephone poles on top of building as well as inside buildings. This should avoid constructing large towers, to which many people object.